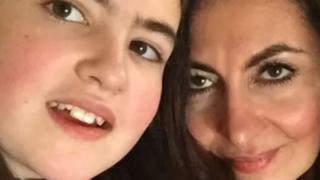 A British woman who faced prison in Dubai over a jibe she posted on Facebook has embraced her daughter after landing back in the UK. Laleh Shahravesh, 55, had faced up to two years in jail after calling her ex-husband's new wife a "horse". Her case was settled with a AED3,000 (£625) fine on Thursday, the campaign group which represented her said. Ms Shahravesh told reporters at Heathrow airport: "I'm really, really happy to be reunited." Her daughter Paris, 14, had pleaded with United Arab Emirates authorities to release her mother, earlier this week. The mother-of-one, from Richmond in south-west London, also thanked Radha Stirling, the chief executive of campaigners Detained in Dubai, who she said had "worked tirelessly to get me home to my daughter". Ms Stirling said the incident was a "grave warning" to social media users over visiting Dubai, with the "vast majority" of similar cases going unheard. She told BBC News: "I think without the spotlight from the international press and the raising of awareness to the UAE authorities this would have gone on for at least six months." Ms Shahravesh was arrested in Dubai, part of the UAE, on 10 March. She had travelled there for her Portuguese ex-husband's funeral following his death from a heart attack at the age of 51. She had been married to Pedro Correia Dos Santos for 18 years. The couple lived together in Dubai for eight months - where Mr Correia Dos Santos worked for HSBC - before Ms Shahravesh returned alone to the UK with the couple's daughter. In 2016, she received divorce papers and discovered on Facebook that he was remarrying. Writing in Farsi on Facebook, Ms Shahravesh said: "I hope you go under the ground you idiot. Damn you. You left me for this horse." In another post, she wrote: "You married a horse you idiot." Detained in Dubai said Ms Shahravesh's ex-husband's new wife, who lives in Dubai, had reported the comments. Detained in Dubai has called on the Foreign Office to provide more explicit guidance about the risks of travelling to the UAE. Ms Stirling compared the UAE's cyber laws to "a loaded gun pointed at the head of anyone using the internet". "Anyone who you might have had an argument with in the past - and maybe you don't even know them, maybe you had a Twitter war with them - they can actually go through your social media and report you to the telecom regulation authority who could then take a police a case against you. It's extremely risky. "The fact is almost everyone who visits Dubai is going to be in breach of those cyber laws and that means they could be subject to arrest. "That's absolutely ridiculous for a country that wants to attract tourism."